One of the best recipes of south Indian cuisine for healthy living is MiLagu Kuzhambu, the taste of which is incomparable when you have it along with rice and sutta appaLam or mOre kUttu. Take out the extract from tamarind with 4 cups of water completely. Remove the impurities and keep aside. Take a little oil in a kaDAi, heat and fry black pepper, coriander seeds, split gram dAl, black gram dAl and fenugreek till golden brown colour. Just before removing from fire, roast the curry leaves with these for a few seconds. Remove from fire. Powder these after they cool coarsely and keep aside. Take the remaining oil in the kaDAi, add mustard to splutter and then Bengal gram dAl. After a few seconds when the spluttering sound comes down add tamarind extract, salt, sugar and turmeric powder. Allow it to boil till it is reduced to half its quantity. Now add the ground masAlA powder and boil again till the oil leaving the side or the entire contents attain the consistency of gravy. Remove from the flame and serve when cool. 1. Those who need it hotter, may add a red chilli or two while frying other ingredients for masAlA. 2. It goes well with sutta (roasted without oil on fire) appaLam or mOre kUttu about which we will discuss later. 1. If you make chips from potato, yam or raw banana, ensure that they are tender and not brittle when sliced. Wash them thoroughly and dry them for a few minutes under the fan in shade over a tissue paper, paper towel or cloth. Then fry them, add a little salt and chilli powder or pepper powder. 2. Those who want to store potato chips for perennial use, may select white potato with thin skin, wash and then slice them into thin slices. Some people grate the potato instead of slicing. Wash thoroughly to remove the starch. Now blanch them in hot piping water mixed with a little table salt. (Blanching means keeping the vegetables in piping hot water for about 10 minutes). Remove, strain the excess water through a strainer and dry them in hot sun till they become completely dry. Ensure that the slices do not stick together. Store them in air tight container. This way you can prepare chips from vegetables like carrot, beet root etc but their shelf life will be for about 2 to 3 months unlike potato chips whose shelf life can be 1 year if properly prepared. 3. Normally some people taste the items they prepare to check for any deficienci8es in the ingredient. But this habit may lead you to taste items prepared as neivEdhyams for offering to deities on pandikai/festival days, by mistake. It is better to cultivate a habit of assessing the quantities of ingredients correctly through experience and trial and error method so that every time you prepare an item you need not taste. It is my experience that if you prepare anything with full involvement and devotion on festival days, the preparations turn out up to the mark. 4. Never heat ghI (clarified butter) directly and prepare anything with that as it gives a bad burnt taste. GhI should be mixed with oil and heated or the item should be prepared in oil and ghI is added later before it is removed from flame unless otherwise indicated specially in any recipe. 5. If you find it difficult to use knife for chopping finely green chillies or any leafy vegetables like coriander, curry leaves, spinach and other greens, then you can use a pair of clean scissors. This has another advantage. 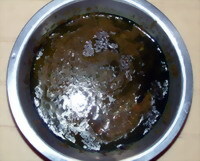 While you have the ingredients in the iluppaichchatti/vANali (wok, KaDAi) for frying, you can save time by this method by cutting the coriander/curry leaves or green chillies over them by the scissors instead of keeping them readily chopped on a board, thus, preventing the contents in the kaDAi from charring. 6. Instead of adding green chilli in food preparation in the form of pieces that you throw and waste after it is served, you can grind them into fine paste and add a little of this paste. This way it is economical since you need to use less green chilli for required hotness and not buy it very often. Even you can prepare this paste with a little salt when green chillies are cheaper, and refrigerate for using from time to time. But ensure that you adjust salt in your preparations as this paste has also salt. 7. Always do not retain kOvaikkAi (green Ivy gourd, kundhru) for more than two days even if you refrigerate. Similarly, if you buy pAgaRkAi (bitter gourd, karElA), refrigerate it after cutting in halves and removing the seed. This will stop it from ripening. 8. Never open the door of micro oven on and often as the temperature suddenly falls down by about 35 to 50 degrees depending on the length of time it is kept opened. This costs extra units of electricity for you. 9. Always keep the fried appaLam and vadAm (fryums) in a tightly closed container to retain their crispness. If kept opened they will absorb moisture very fast and become like old cloth pieces. This entry was posted on March 13, 2011 at 11:13 pm and is filed under MiLagu Kuzhambu with tags Bengal gram dal, bitter gourd, black pepper, chips, chopping, clarified butter, coriander leaves, coriander seeds, curry leaves, fenugreek, fry, ghee, green chilli, iluppaichatti, ivy gourd, kadai, knife, kovaikkai, micro oven, Milagu kuzhambu, more koottu, mustard, pagarkai, potato, red chilli, refined oil, roast, salt, scissors, spinach, split gram dal, sugar, sutta appalam, tamarind, turmeric powder, vadam, vanali, vegetables, wok. You can follow any responses to this entry through the RSS 2.0 feed. Both comments and pings are currently closed. Thanks! I too am aware my son! You always relish it with sutta appaLams!